Place 3 power counters on Earthrise Hotel when it is installed. When there are no power counters left on Earthrise Hotel, trash it. When your turn begins, draw 2 cards and remove 1 power counter from Earthrise Hotel. So after a few games with Earthrise Hotel in place of Wyldside in my Noise deck, I can say that the main problem with this card isn't the initial cost, it is that it leaves you after three turns. If you play Noise like I do (and it may be fair to argue you shouldn't), you have now gotten used to letting Wyldside burn away for the majority of the game. Without being able to tutor for anything besides viruses, Noise depends on massive card draw, especially if you run standard breaker suites. (And let's be honest if you're only running Crypsis/Darwin while relying on Hades Shard you are a terrible person.) Even when I had Earthrise in my starting hand, I still felt "under-drawn" by mid game. Resorting back to one click/one draw after the hotel kicked me out really ruined my game's pace. I personally feel that Wyldside + Daily Casts is a much better team than Earthrise Hotel + Armitage Codebusting. The number of clicks spent in each combo tend to average out, but with the former I get through my deck more efficiently. I could see using Earthrise more in a Noise (or any other Runner) deck that doesn't use Aesop's Pawnshop. With Aesop's in play you always have an out if you get sick of wasting credits to WS. But if you would like to ditch Aesop's for a more traditional economy for some reason, Earthrise Hotel has the benefit of not having to marry it for the entire game. For me though, Wyldside still suits my needs better. Earthrise Hotel is seen as a straight swap for Wyldside is a lot of Anarch decks, and with good reason - it doesn't cost you a click a turn. However, there is a problem with Earthrise Hotel that there isn't with Wyldside - the fact that it only lasts 3 turns. This means that unless you draw into another Earthrise in those 6 cards, you are going to be back where you started afterwards, digging for another. Additionally, if you draw your second, or even your third Earthrise whilst the first is out, you will have to keep them in your hand, and not simply discard them like with extra Wyldsides, clogging up your hand. You have to realise that this card is not Wyldside. It is to Wyldside as Daily Casts is to Hard at Work, it replicates the effect for a few turns before trashing itself. If you normally leave a Wyldside going for most of the game, and run on a limited budget, this might not be the card for you. However, in Shaper, and most definitely in Criminal, this card will shine, not because it is a Wyldside without the influence cost, but because it synergises with their playstyle. Earthrise Hotel gives 6 cards for 1 card + 1 click + 4 credits. So, it simply converts 4 credits to 4 cards. I think it's pretty bad unless you also play The Supplier. With it, you get 4 cards for 2 credits. The Supplier is always a good card. Not only you get a discount for every resource and hardware but you may also store unplayable cards until you get the money to install them. Also, Earthrise Hotel is in competition with John Masanori. John is likely to give more cards for an investment of 2 credits (0 with The Supplier) and is tutorable with Hostage, so you do not need to play 3 copies of him. Earthrise Hotel is a worthy substitute for Wyldside these days. With click compression Corp decks running rampant (such as Replicating Perfection builds), one extra click available to the runner can be huge. For 4 credits, you get to play a Daily Casts for drawing, essentially. The 4 credit cost to play might seem a little steep, but it opens up an extra click that would be taken by Wyldside for 3 turns. 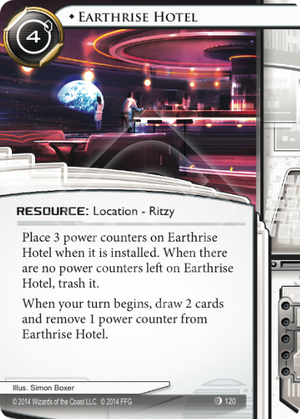 Earthrise Hotel was built for decks that want to run as often as possible each turn. If you dont mind losing a click every turn and can readily get rid of it (ala Aesop's or other means), Wyldside is probably a better choice. If you dont mind spending a little bit more for a temporary effect that lets you spend the full 4 clicks each turn, Earthrise Hotel is probably the way to go. Earthrise Hotel is the new Sure Gamble, that is to say, it will be featured in Runner decks of all types for the foreseeable future. This is Daily Casts for card draw. Valuing 1 card at 1 click at 1 credit, this card gets you 6c for a 5c investment. A better way to look at it, though, is click decompression. This card gives you 6 clicks for a 1 click investment. One could argue that it gives you 6 clicks for a 5 click investment, but in practice, I think Earthrise Hotel becomes something more like three All-nighters in a row, without the rough morning-after. I think this card becomes even more effective in tandem with clickless economy, like Daily Casts or Underworld Contact. I think this card's pretty good. Comparing it to Quality Time, it gets you 6 cards for 4 credits, while Quality Time gets you 5 cards for 3 credits. However, Quality Time has the advantage and disadvantage of happening all at once. It gets you the cards quicker, but will likely make you overdraw. Also, Quality Time's 1 influence while Earthrise is none. Therefore, I expect Earthrise Hotel will go into slower decks that don't want to spend the influence. I don't think it's going to have a huge impact on the meta, but I do expect this'll be seen in many decks. Side Note: This'll probably replace Wyldside in lots of Anarch decks.